After his second mission, Thornton adapted well to the gravity environment and his resistance to motion sickness increased. A few days after coming home, he flew in a T-38 with a colleague ''to try to make one another sick,'' but they ran out of things to do without inducing sickness. He assumed that, as with the adjustment to space flight, getting reacquainted with life back on Earth would take a couple of days. He did not encounter this on either of this two flights, but the theory was borne out by the crews from much longer flights than his own. 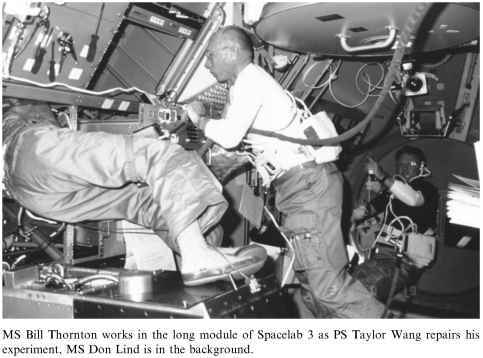 MS Bill Thornton works in the long module of Spacelab 3 as PS Taylor Wang repairs his experiment, MS Don Lind is in the background. problems restricted any cooperative data gathering on the Spacelab mission that could have been used for comparison with the findings from their first missions. 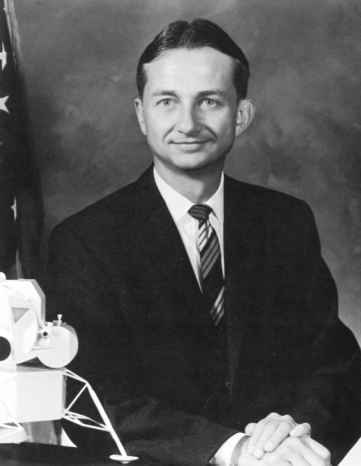 Thornton believed that crew selection should be based on requirement, not politics, so his assignment to a third mission would have been fine, as long as it was beneficial to the programme and to his studies. A long duration mission would have suited in that respect. In 1986, however, Challenger was lost, grounding all assigned crews and cancelling planned missions, Thornton was not assigned to a crew at that time and even two years later, in August 1988 (just prior to the resumption of flights), Thornton stated that he should not be considered for flight assignment when the most important need was to re-qualify the Shuttle system. When that had been achieved and crews resumed his work on long duration space adaptability, he would have loved to have flown again.